Master Sgt. Christopher Herndon is one selfless Hero with a big heart. Both of his careers are about saving lives and putting others before himself. Herndon works at DCH Regional Medical Center which proudly supports and hires military veterans. They wanted to show their appreciation with a surprise for Herndon. A registered nurse at DCH Regional Medical Center was given a hero's welcome Friday on his first day back to work after his fifth deployment with the U.S. Air Force Reserve. Master Sgt. Christopher Herndon spent September through January stationed in Germany, where he served as a flight medic. "We'd fly two or three times a week," Herndon said. "We'd leave Germany to go to Iraq or Afghanistan, wherever people are that need us, then transport them back to Germany, or load them up in Germany and fly them to Andrews Air Force Base in Maryland." Herndon has worked at DCH since 2012, and returned to his job in the trauma surgical intensive care unit Friday morning. 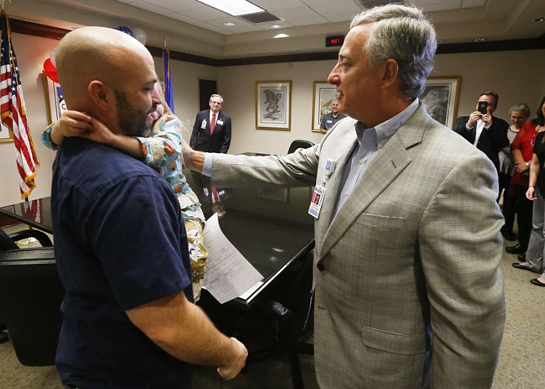 Believing he was going to be fitted for a respirator, he was instead led to a conference room where his wife, Misti, and their 4-year-old daughter Ava joined his father, his supervisor and several DCH administrators for to welcome him home. "It meant a lot, especially seeing all the upper level people show up," Herndon said "A whole roomful of people showing up unexpectedly." James Shirley, the hospital's facility property manager, said DCH employs 11 active-duty service members and is glad to support them however possible. Herndon's nurse manager, Donna Prophitt, echoed Shirley's sentiments and said she is always willing to work with their military employees to schedule around drills and deployments. "As a leader and manager here, I serve my staff and they in turn serve our patients. It's a very easy thing to do," Prophitt said. "If we take care of (military employees), they take care of us, so it's a win-win on both sides." Herndon said being back on the ground will take some getting used to after patching up service members on a plane for six months, but said he's glad to be back on the job. He said he might consider a sixth deployment, but right now his focus is on the work at DCH and his young family.